Sylvia Barter was a special guest on Scholastic during the "Flight of Amelia Earhart" project. Like Earhart, Ms. Barter is a pioneer in women's aviation, serving as one of the first female military pilots during World War II. 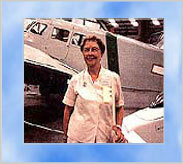 Ms. Barter was also a member of the Ninety-Nines, the organization of women pilots cofounded by Amelia Earhart in 1929. Read about Ms. Barter's fascinating life and experiences in the following transcript of her bulletin board exchange. I was raised on a ranch. I had my own horse and enjoyed horseback riding. I also enjoyed school activities  I was very active. My favorite subject in school was English. I lived in a small valley where I knew everyone and everyone knew me. When was the first time you flew in a plane as a passenger or as a pilot? When I was about eight years old, about 1928. My father owned a ranch in a valley in California. Barnstormers would land in my father's field and take others for rides in open-cockpit planes. My sister and I got rides in the open area of these high-wing planes. I always loved flying  I thought that was the thing to do! How did your family react when you told them you were going to be a pilot? My family was not too overjoyed at my decision. Flying was still fairly new when I was a little girl; they were concerned about the safety of it. But they supported me all the way. They were glad that I was doing something I enjoyed. When you were a little girl, did you think you could be anything you wanted when you grew up? Yes, I was sure of it. I had parents who encouraged us to know we could do anything we wanted to do  so long as we were willing to work for it! I think because I have loved to fly from the time I was a little girl. Did you go to college ? If so, where? I went to junior college in Salinas, California, and Merit Business College in Oakland, California. If I hadn't been a pilot, I had planned to go into medicine. I wanted to become a doctor. How old were you when you decided you wanted to fly? When did you take your first flight lesson? I took my first flight lesson in Salinas, California, when I was twenty years old, in March of 1940; I was very eager, not nervous. Is it difficult to fly a plane? No, you must be very precise and accurate  and want to fly. How long did it take you to learn to fly a plane? You fly eight hours with the instructor before you solo, then you have to fly 35 hours before you get your license. It's 35 hours of flight time, and about that many hours of ground-school time. You have to learn a lot in class, then you have to pass a written and flight test. The written test is given by the FAA (Federal Aviation Administration), because the government has very strong rules and regulations on flying. The flight test must be given by a certified FAA instructor. I started in March 1940 and got my license that September  so, in all, about six months. What was your destination the very first time you piloted a plane? My first flight was to Monterey, California, which was within my own county  all of a 20-minute flight! What kinds of planes did you fly? I learned in a 'Little Club,' a single-engine, 50-horsepower plane. It had only two seats, one behind the other. When I got into the air force, I flew a much larger aircraft  the primary trainer was a Fairchild, 175-horsepower, open cockpit. Then in basic training, I got into a AT6  that's a lovely plane, much more horsepower. Then I flew a twin-engine aircraft, a Cessna UC78. It had a 42-foot wing span, two large radial engines, it was ten feet tall, and about 42 feet long. How did it feel to fly in a plane without a roof? It was very exciting the first time  it was on our primary trainer, without a roof, without a cockpit. Very free! Was it hard to fly without a lot of instruments on the plane? No, because we had enough instruments to fly safely. We had an altimeter to show us high we were, an air speed instrument to show us how fast we were going, a turn and bank indicator, which shows you the angle of your bank as you turn the plane. Those were very basic when I started to learn to fly in 1940. Did flying the airplanes of the 1930s require more physical strength than those now? The ones I flew in the forties were such small airplanes. They didn't require much physical strength. The planes from the thirties were very much the same. What were some of the dangers of being a pilot then? You had to always follow the rules and be aware of other aircraft in the air at all times. Like today, you had obey the control tower's commands and stay at the proper altitude and air space to which you had been assigned. If not, well, you read the papers! I've read that Amelia "ground looped" and crashed on her first attempt to fly around the world. What is a "ground loop"? A ground loop is when you're on the runway, and instead of just going straight ahead, the airplane does a complete spin on its wheels. So you do a 180 right there on the ground. It can happen in a lot of ways  you could touch the brakes accidentally, a gust of wind could hit. But it's usually pilot error. You're not supposed to ground loop! Did you make any errors when you were flying? I think in all things you make errors until you do it right. But when you're flying, if you find you're doing something wrong, you immediately correct it so it's right! Were you scared when flying at high altitudes? No, people who flew weren't scared because they studied very hard before they ever got into an airplane so they would know exactly what to do when they were in the air and an emergency came up. What is the longest distance you have ever piloted a plane? The longest I ever piloted was a five-hour trip. I was flying on a WASP mission from Douglas, Arizona, to San Bernadino, California. What did you do when you had to go to the bathroom? Have you ever flown across the ocean? Have you ever been close to crashing while flying? No, I've been very low on fuel, but I was near the airport when that happened. Did your plane ever stall in the air? No, it never stalled when I wasn't expecting it. But part of learning to fly is learning to stall the aircraft and recover from that stall. See, when you come in from a landing, you're actually 'stalling' the aircraft on the runway. So you have to learn to stall in the air so you can handle it when you have to stall when you land. What did you like about flying a plane? I love being up in the air. The view is very exalting, wonderful. But it is a very good feeling to go places so quickly  a real feeling of accomplishment to get from one point to another! How many flights have you flown? Over 19 years of flying, I have flown about 850 hours. For how many years did you keep flying? Do you still fly a plane? In 1940 I got my pilot license. I flew until 1944, then took 30 years off to raise my family. I got my license again in 1976 and flew until 1991  so that's 19 years altogether. My husband and I owned our own plane for the last few years. It was a Cessna 172  a four-seat, enclosed, high-wing, single-engine plane. It was a very nice cross-country plane. So, no, I haven't flown for about four years. I'm 77 years old. I still have my license, but my flying days are over. I live next to airport now  I love the sounds of the airplanes, and I'm still active in women's pilots groups. Age is no barrier. What one event from your life are you most proud of? Well, I'm proud of a lot of things. I am proud of what I did in the war as a WASP and having been a woman pilot. I'm also proud of having raised four children who are now healthy adults with children of their own. What was it like to be a female pilot at a time when there were relatively few? It was no different from now, a woman in a man's world. But we were treated with respect; we had shown that we were able to fly safely and well. I found that personally I received a lot of commendations for the kind of flying that I did. Did anyone ever make you feel like you were stepping out of bounds when you became a pilot? No, no one ever made me feel uncomfortable. Even the male pilots supported us; they were glad to have anyone interested in aviation  male or female. Are there many women pilots today? Yes, there are many women pilots today. Women pilots are not only flying in civilian aircraft but many are military pilots, too. Were there many other women pilots from Earhart's period that you remember when growing up? They were many  outstanding women in their time. But Amelia Earhart was the outstanding one, as far as I was concerned. What one person, do you feel, best exemplifies the changing role of women in aviation today? Maybe the first woman in space, Sally Ride. In general, things have really changed a lot for women in our country and in the world. I'm a young girl and I think I want to be a pilot when I grow up. What can I do now to prepare myself? You can study about aviation, or go to an airport and talk to an instructor about wanting to learn to fly. You'll find most instructors are happy to talk to you about different aspects of being a pilot or recommend books to read. Even though you can't get a license until you're sixteen, you can still get information that would be very helpful to you. Your interest in aviation is very encouraging. Remember, there's no limit to your opportunities if you want to pursue that. I would encourage you all to get acquainted with aviation and the future it holds for you. What inspired you to be in the WASP program? I already had a private pilot's license, logging in 55 hours of flying time. And when they established the WASPs (Women's Airforce Service Pilots), they contacted every women in the U.S. who had a private pilot's license and many hours flying time  my 55 hours qualified me. After a physical and an interview I received an invitation to report and went to Sweetwater, Texas, where they trained all of us. My husband was already in the air force, and I was anxious to be part of the war effort. What sort of qualifications did you need to become a WASP? You had to be between the ages of 21 and 35, be five foot two inches tall or taller, and have logged at least 35 hours of flying time. (The age requirement eased to 18 and a half as the program progressed). I was 23, five foot nine inches tall, had over 55 hours in the air, and I was raring to go! What was WASP training school like? I joined the seventh class, a total of 104 women. Training was military in every respect. We were restricted to base, housed in barracks, marched to ground school, to calisthenics, to flight line, to mess hall and to parade ground. Our lives were completely regulated, but we sang as we marched and loved it. Our standard wearing apparel was a one-piece olive-drab coverall which we called our "zoot suit." Dress-up parade uniforms consisted of white shirt, beige pants and beige overseas cap. Later, in 1944, regulation uniforms were issued in Santiago Blue. Ground school and flight training were conducted along the same lines as the male Air Corps cadets and flight tests by army pilots were very exacting and were given on a regular basis. Our regular instructors were civilian but were dedicated to teaching us "the Army Way." Our training was thorough. Planes which we flew during training were the Fairchild PT-19 primary trainer, the Vultee BT-13 basic trainer, and the North American AT-6 advanced trainer, and the UC-78 and AT-17, Cessna twin engine advanced trainers. We trained very hard through a hot Texas summer and in November 1943, 59 of our class proudly marched up to accept our silver wings. Although we were civil service, we wore the uniform of the Air Corps officer and were given the unofficial status of Second Lieutenant. The first six classes were involved in ferrying all types of aircraft within the United States. When our class graduated we were ordered to various military bases  some to weather bases, some to bases where target-towing airplanes were needed, and others to flight schools. We were all confident and jubilant in the knowledge that we were doing a patriotic duty in being able to relieve a male pilot for combat. Did you know Jackie Cochran? If so, how did you meet her? Yes, she was the head of the WASP program. She would fly into Sweetwater, Texas, where we were training. She was a very attractive and personable lady  a good leader. And, of course, she was very interested in aviation. She was a very famous woman pilot. Why do you think the Army Air Force did not use Cochran's idea for a women's air force when she first came up with it? Well, they finally did. But she had to prove to them that it was a workable project  which she did! She went to Washington, D.C., to prove her ideas. What was your scariest moment as a WASP? I can't really say. There were many scary moments when there were so many of us coming in for a landing at the same time. You had to leave a narrow margin between you and the next aircraft when landing. My aunt served in WW II in the WACs (Women's Army Corp, the administrative officers on the ground). One of my favorite pictures in the family album is of her in uniform standing in front of a plane. Are there reunions of women from this era who served in the military? Yes, WASPs do have reunions  we meet every other year. We meet all over the country. Four years ago, we met in Washington, D.C.; next year, we're going to Omaha, Nebraska. I keep in touch with all the other WASPs. A sisterhood developed in the experiences we had together  not only in training, but in the execution of our duties and the fact that we were serving our country in a time that we were in need. We have a roster of names and addresses of all the WASPs  both living and passed away, and every three to four months, we have a magazine that comes out. It tells what's happening and provides news from all the areas. How did you feel when the WASP program was disbanded? When the WASPs were disbanded in December 1944, I felt a deep sense of sadness. There were so many women still waiting to get into the program. We were told, however, that the need which had existed was no longer there as male pilots were returning from overseas to take up their stateside duties again. Many of the WASPs joined the regular military services after being disbanded, though not on flight status. Of the 25,000 women who had originally applied to enter the WASP program, 1,830 were accepted and 1,074 graduated, earned their wings and served their country in a time of need. These women pilots had done an outstanding job, flying every type of aircraft used by the military at the time. A large number had been trained in Pursuit School and, along with all the other planes they flew, were qualified to ferry this fastest and most complicated aircraft of World War II. Those who were assigned to towing targets for gunnery practice did a magnificent job in a very dangerous environment. A total 38 women lost their lives while serving, 11 in training and 27 on active duty. When did the WASPs receive veteran status? Our veteran status was finally forthcoming in 1979, due to a long-fought battle by a dedicated group of our active WASPs. Those of us who could not be in Washington, D.C., in person were wholeheartedly there in spirit. Our reunions are held every other year, the last one having been held in Washington, D.C., in October 1994. We shared a period in our lives like no other. A deep friendship exists among all of us and when we renew memories from the days of our service it seems as if we are all young again. Was the U.S. Air Force a good experience? Yes, it was. It was a privilege to have served in the United States Air Force. I still keep in touch with all the other WASPs. A sisterhood developed in the experiences we had together  not only in training, but in the execution of our duties and the fact that we were serving our country in a time that we were in need. What was it like being the only female pilot at Douglas Army Air Base? It was a little scary at first. They didn't really have any experience with female pilots at the Douglas Army Air Force base in Arizona. There were 500 officers, who were either instructors or administrative personnel. They looked at me as an oddity in the beginning, but I had to show them that I could fly an aircraft, and I was assigned to engineer and maintenance department, where I did a lot of flying. They knew I could handle myself, and gained a lot of respect for me. I had occasions to fly with most of those officers from time to time. I made many friends, some of whom are still my friends today. Did you ever fly combat missions in WW II? If so, what was it like? WASPs didn't fly combat missions in the war; we flew during World War II within the U.S. We felt very proud of doing our duty for our country. I was anxious to be part of the war effort. How old were you when you were a wartime WASP pilot? I was 23 and 24 years old. No, during the war I only flew within the United States. Many of the WASPs towed targets for the ground personnel of the Army Air Force who were practicing targets. But as far as I know they were never shot down. How many flights did you make as a first pilot during World War II? Most of my flights were as the first pilot, or as the only pilot, but I did make a number of flights as a co-pilot. Co-pilots are required on some aircraft, such as twin engines or larger. Two pilots are needed  one in command and one as co-pilot. A co-pilot's job is to assist the pilot. They call the tower, check the course, help plot the course, monitor the radio, check weather reports, check instruments, and keep the pilot in tune with the estimated times of arrival and departure. Were you and your husband afraid of getting hurt or possibly injured in World War II? No, neither of us was. He flew B-24 big four-engine bombers overseas. He came back in one piece. Is your husband still alive? No, he passed away in September '96 after 56 years of marriage. Was it difficult flying during the war? No, because we had enough instruments to fly safely. I didn't fly any combat missions overseas; I flew exclusively in this country, and only from one base. What was it like being a member of the Ninety-Nines? I enjoy being with other women pilots. They're very active in teaching children about aviation. They take kids flying sometimes and teach them about aircraft, how to check a plane and all the controls. They go through this with young children. They're very good at what they do. How many women were in the Ninety-Nines? When the Ninety-Nines started, there were 99 women at the first meeting, Amelia Earhart among them. I gather she was the first captain or president of the group. I'll find out how many Ninety-Nines there are today and let you know! As of December 31, 1996, there were 36,433 women pilots in the United States. When the Ninety-Nines was cofounded by Amelia Earhart in 1929, there were 99 members. Today there are 6,500 members from 35 countries around the world, including: the United States, Pakistan, Spain, Germany, South Africa, Switzerland, India, Japan, Canada, Saudi Arabia, Australia, and Israel. Do you remember when you first heard of Amelia Earhart? What were your reactions? I was in high school when I first heard of Amelia Earhart. I was very interested in what she was doing. I did not meet her personally but she was in the news and we were very much aware of her activities. She was a national celebrity and was asked to give speeches in many places. She was very much in demand wherever she went. She had an aura about her. She very definitely made news! Did you know Amelia Earhart? What was she like? I didn't know Amelia Earhart. I was in high school when Amelia Earhart disappeared, but I know a lot about her because of the women's pilots groups I belong to. She's very much a model for us. She's a role model because of her willingness to complete the job she had set out to do  not only in the beginning, but when she decided to fly around the world. Even though she didn't make it, she was still a role model. She carried herself very well, with dignity. What do you think happened to Amelia Earhart when she disappeared over the Pacific Ocean, near Hawaii? I really wish I knew, along with the rest of the world! I do think though that they probably ran out of fuel and went into the sea. I can't even speculate. There are so many different versions about what people think happened. But I feel like we shouldn't dwell on her disappearance, but instead celebrate her life. She was definitely on a trip that she felt was very important. I think it's like what other modern-day aviators are trying to prove  you can do whatever you set your mind to. Did Amelia have any backup crew to help her on that last flight? Her only backup crew was Fred Noonan, her navigator. She was the pilot in command and he was along as her navigator. It was not unusual to have a navigator when flying a twin-engine aircraft. It was also not unusual that the pilot receives the recognition. What were people's reactions to Amelia Earhart's disappearance? I think the mystery of it was the same as it is today. We all wondered what happened. The whole navy was out there searching for her, but didn't find any trace. We were all concerned. I was especially concerned, being a women knowing that one day I was going to fly. At first it was not a catastrophe, though, because we kept thinking they would find her. We thought for years that they would find her, or at least discover a sign of her. We have read about a number of other women pilots that flew when Amelia did. Why do you think she became so popular compared with the others? Because the other women were instructors and were not as traveled as Amelia Earhart. She was also setting records  and a newsworthy item all the time. But she was not flamboyant at all in the way she carried herself. Her personality was very shy. Even in her speeches she was quiet in her approach to everything. I don't think she wanted the publicity  but I think she was proud that as a woman she was doing the job she set out to do.